The 5 Element system evolved out of a need to understand and interpret the world around us. Through careful observation, the ancient Chinese were able to see various patterns. The number Five was found to be particularly useful for describing natural cycles. In every cycle in life you can see the workings of these five fundamental movements of energy. 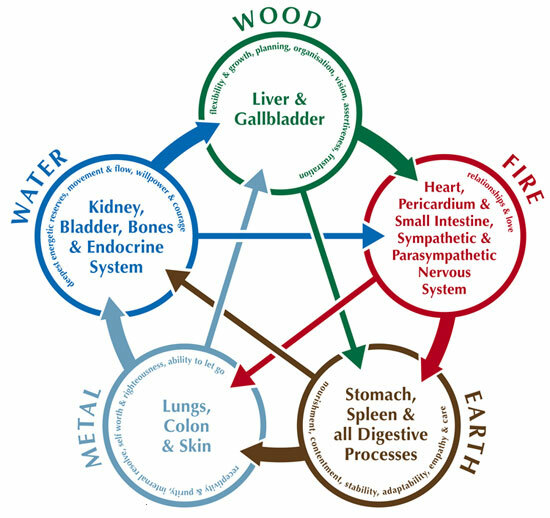 The names given to these five phases are: Wood, Fire, Earth, Metal, Water. In the cycle of the seasons, we can see the clearest manifestation of the five elements. Wood corresponds to Spring. Fire corresponds to Summer. Earth corresponds to the harvest. Metal corresponds to Autumn. Water corresponds to Winter. Take wood for example. Spring time is characterised by a powerful upward and outward movement. Young shoots burst through hard ground and seemingly dead branches spring back to life. Each element also manifests at the emotional level. Wood gives us the ability to be exuberant and assertive. When this exuberance becomes blocked, we become frustrated and without hope.